Magnetic balance test of transformer is conducted only on three phase transformers to check the imbalance in the magnetic circuit. Then apply single phase 230V AC supply across one of the HV winding terminals and neutral terminal. 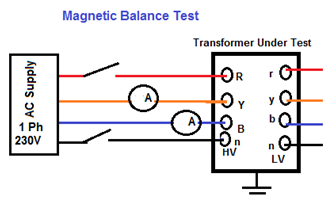 In case of auto transformer, magnetic balance test of transformer should be repeated for IV winding also. There are three limbs side by side in a core of transformer. One phase winding is wound in one limb. The voltage induced in different phases depends upon the respective position of the limb in the core. The voltage induced in different phases of transformer in respect to neutral terminals given in the table below. 415V, Two phase supply is to be applied to any two phases terminals on HV side of Power transformer and voltages in other two phase combination are to be measured with LT open. Sum of the Resultant two values shall be equal to the voltage applied. To checks the insulation property between Primary to earth, Secondary to earth and between Primary & Secondary. HV high voltage test: LV winding connected together and earthed. HV winding connected together and given Following HV Supply for 1 minute. LV high Voltage test: HV winding connected together and earthed. LV winding connected together and given Following HV Supply for 1 minute. 33KV Winding =70KV High Voltage. 3 Phase Variable Voltage & Frequency Source. The following Dielectric tests are performed in order to meet the transformer insulation strength expectations. Switching impulse test: to confirm the insulation of the transformer terminals and windings to the earthed parts and other windings, and to confirm the insulation strength in the windings and through the windings. Separate source AC withstand voltage test: to confirm the insulation strength of the transformer line and neutral connection terminals and the connected windings to the earthed parts and other windings. Induced AC voltage test (short duration ACSD and long duration ACLD ) : to confirm the insulation strength of the transformer connection terminals and the connected windings to the earthed parts and other windings, both between the phases and through the winding. Partial discharge measurement: to confirm the “partial discharge below a determined level” property of the transformer insulation structure under operating conditions. All the terminals of the winding under test should be connected together and the voltage should be applied. The secondary windings of bushing type current transformers should be connected together and earthed. The current should be stable during test and no surges should occur. A single phase power frequency voltage of shape approximately sinusoidal is applied for 60 seconds to the terminals of the winding under test. The test shall be performed on all the windings one by one. The test is successful if no breakdown in the dielectric of the insulation occurs during test. During the Separate source AC withstand voltage test, the frequency of the test voltage should be equal to the transformer’s rated frequency or should be not less than 80% of this frequency. In this way, 60 Hz transformers can also be tested at 50 Hz. The shape of the voltage should be single phase and sinusoidal as far as possible. This test is applied to the star point (neutral point) of uniform insulated windings and gradual (non-uniform) insulation windings. Every point of the winding which test voltage has been applied is accepted to be tested with this voltage. The test voltage is measured with the help of a voltage divider. 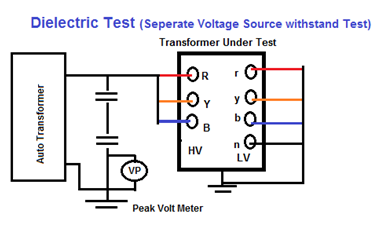 The test voltage should be read from voltmeter as peak value divided by2. Test period is 1 minute. During test, normally the test voltage is applied to the low voltage winding. Meanwhile HV windings should be keeping open and earthed from a common point. Since the test voltage will be much higher than the transformer’s rated voltage, the test frequency should not be less than twice the rated frequency value, in order to avoid oversaturation of the transformer core. The test shall start with a voltage lower than 1/3 the full test voltage and it shall be quickly increased up to desired value. 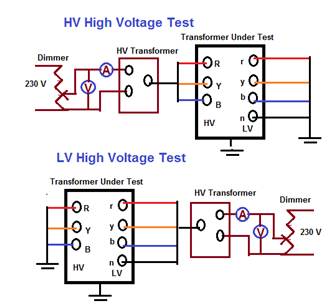 The test voltage can either be measured on a voltage divider connected to the HV terminal or on a voltage transformer and voltmeter which have been set together with this voltage divider at the LV side. Another method is to measure the test voltage with a peak-value measuring instrument at the measuring-tap end of the capacitor type bushing (if any). Test period which should not be less than 15 seconds. The duration of the test shall be 60 second. 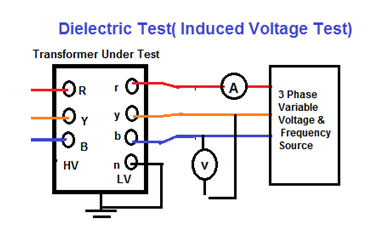 The test is accepted to be successful if no surges, voltage collapses or extreme increases in the current have occurred. The test is successful if no break down occurs at full test voltage during test. All the dielectric tests check the insulation level of the Transformer.